The Two Sides of Ana: Episode 45 | TeleNovela Channel - Bringing you closer to lifes drama. 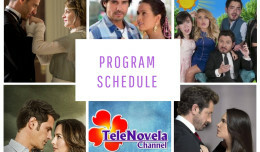 Graciela tells Cristobal why Ana is impersonating Marcia while Ana tells Vania that it bothers her that Ignacio still harasses her and that he is on drugs. Meantime, Cristobal insists on confronting Ignacio while Ignacio follows him in a hotel and hangs him with a belt.